← The Human Randomizer is Coming To Get You! That’s actually the name of a tea that I loved but can no longer find. But today, it’s Me. Woke up at 3:15 and that was all she wrote. I tried, I really did, to go back to sleep but by 3:45 I was incredibly frustrated and…well…I got UP! Now I’m trying to focus here. Ralph and I went out yesterday because he had Birthday gift cards burning holes in his pocket. We headed to Barnes & Noble first. I have avoided B & N lately for various reasons. First reason is that I have two huge piles of books to read, most of them gathered from Goodwill and I don’t feel like paying “real” money for any books right now. Second reason is I have gathered almost enough B&N gift cards to purchase a Nook. I keep going round and round with myself about purchasing one. I think it’s a great idea, especially since I won’t be spending much of my own money. But I can’t justify then having to pay for books, when I have so many sitting there unread. I did have a long discussion with the young lady at the Nook counter, getting some info on it. I’m fairly sure it will be an eventual purchase, just not now. Lucky for me, the gift cards won’t get moldy sitting there waiting for me to use them! Ralph had also gotten a gift card to the Colonial Diner in Woodbury so we decided that lunch would be a good idea. We used to go here all the time but haven’t been in quite a while. Funny, several of the waitresses recognized us and asked where we’d been. We hadn’t been there for various reasons but a gift card was reason enough to go back. I didn’t have to think hard about what I would have. I went to an old favorite. This is called a Balsamic Spinach salad but it’s supposed to have chicken and sausage on it. Of course, I ask to have that left off. 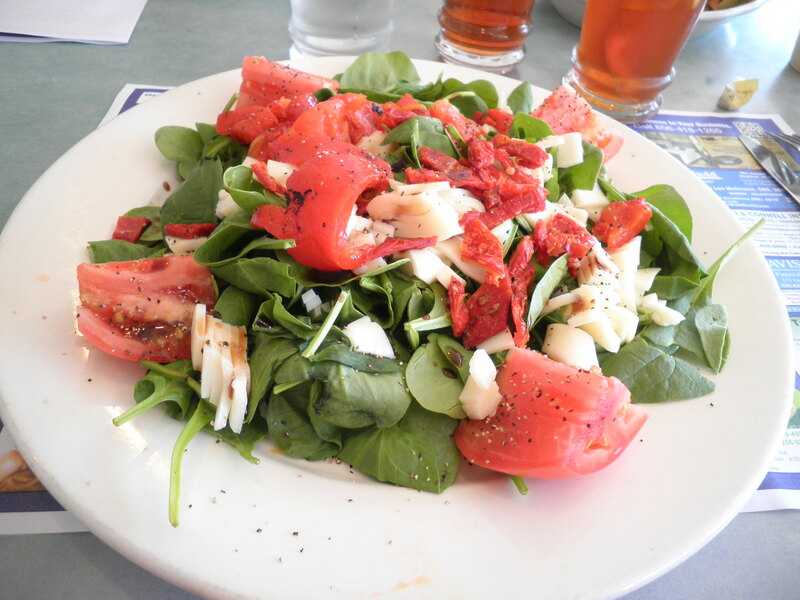 What I keep is the spinach, tomatoes, sun-dried tomatoes, roasted red peppers and mozzarella cheese. I get the balsamic vinegar on the side. It’s delicious! With all of the other spinach I’ve been eating, I will soon be able to best Popeye in an arm wrestling contest! I love spinach and this was delicious! Ralph had a turkey and bacon club with fries. I confess I ate a few of his fries. He also had a cherry Danish. Our kind waitress brought 2 forks with the Danish. I am proud to say that my fork remained clean…no danish passed my lips! We came home to find that our air-conditioner isn’t working properly. Time for a visit from the PSE&G man, I guess. Hope the weather stays like Thursday. Not too hot. With our luck it will hit 100 degrees this weekend and we won’t be able to get the man here to work on the A/C!! Oh well, Life goes on with or without A/C. This entry was posted in Uncategorized and tagged books, salads, Urbanspoon. Bookmark the permalink. happy friday, fran! we’ll look on the bright side of you waking up so early today (!!) – you have lots of time at your disposal (and nothing wrong with enjoying some early morning computer time!). glad you had fun at b & n – our canadian version would be chapters, and time flies whenever i venture in there – so much to poke about and look at. good for you for not purchasing anything! Dana, that’s the thing. I should save them if I want a Nook…but there are books I would Like too. If I get the cheaper Nook, I’d have credit left to get the books ON the Nook. If I get the Nook I want, I have to add to it. Too Many Decisions!! !~ Hope you enjoyed storytime!! impressive control with books AND danish! I really like colonial diner. breakfast is always awesome (and so are the mozzarella cheese fries). haha. your salad looks fabulous. good luck with the air conditioning! I turned mine up so many times last night before I could get comfortable. see you tomorrow morning! I’ll look forward to seeing you!!! We are Such Bookies!!! It’s a wonderful thing! sorry about your A/C… that’s never a good problem! 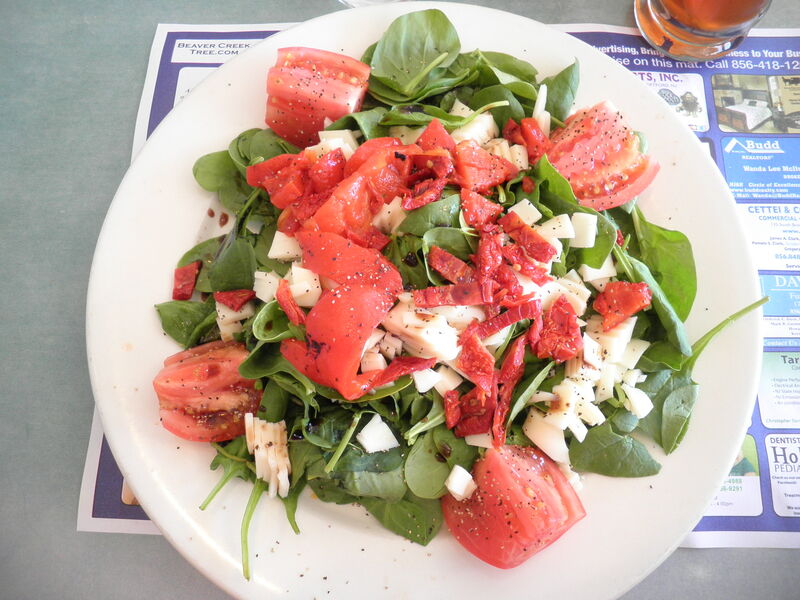 fabulous salad – i love the tomato + mozz combo. i should have been italian! I think everyone is partially Italian, Laura! I say you’re one of the family! Luckily it’s not too hot right now and it should be comfortable for the weekend, so we can wait until Monday to try to get it fixed. Have a great weekend! Ugh, I wake up a lot too (and I never used to). At least you got to eat a yummy salad. I do that a lot with books too. I always have a big pile in my closet but it’s hard for me to not buy more. I for sure have a book problem. Hi Fran, I nominated you for a Food Stories Award! Well, Thanks, Jannifer! Does the link tell me what to do? I so excited! that salad looks amazing. yum. and I could spend about 5 hours in Barnes & Noble………..
Hi there! Yes, I love my salads and keep going back for more. Same thing with B&N…I could spend a weekend! Thanks for stopping by, please visit again!